Discussion in 'Pokémon - Diamond & Pearl: Galactic Battle' started by Serebii, Apr 2, 2009. On their way to the next town, Ash & Co. come across a lone Snover. This Snover quickly becomes friends with the gang but seems to be lost. However, Team Rocket have their eyes set on the Snover. Will Ash & Co. manage to protect it and get it back to where it comes from? Bare bones in the plot department. Episodes that hinge on Team Rocket coming back again and again have never been much to write home about, but this was one of those episodes where 'the little things' were what counts. Snover was reeeeeal cute, and had a fun personallity, as well as some interesting attacks in it's arsenal. It's a shame we've got a character with a full team, another who rarely uses anything but one in particular and....one that rarely uses anything full stop, since it would've made for a great new addition to the group. I mean, it was ridiculously obvious that the frozen vegetable would be departing with a convinient group of children by the end of the episode thanks to that lovely magazine scan, but that didn't stop it from being disappointing. But getting back to the positives, I also enjoyed Grotle's involvement with said Christmas turnip, since it gave the poor guy a chance to show a little more personallity this time around. As cool as Rock Climb was, it still strikes me as a lazy move on the writer's part, since it's essentially gave them an excuse to make the pokemon fast again. I really liked this episode. Grotle learns Rock Climb, Grotle actually uses synthesis a move thought to be long forgotten. And it was rather hilarious that Grotle produced acorns and was feeding some flying Pokemon. Not to mention Grotle actually uses other moves aside from razor leaf. I actually saw energy ball. And I really liked the whole scene when Grotle learned rock climb to the end of the episode. I liked Snover too, and if Ash did have a spot open I could easily see Ash catching it but now it gets to entertain some kids and a teacher. I thought it was funny that Brock getting jabbed by Croagunk showed Brock's reaction in a few different scenes. Edit: About Grotle being a fast Pokemon, I doubt it'll apply to anything that isn't a rock. I doubt in the league Grotle will move that fast, as it could only be that fast due to the whole mountain thing. I bet when it normally uses the attack it'll still be slow. And only speed up like that when it actually has something to build speed on. And of course I would love it if using rock climb in a "more purposeful" way would show up. Like climbing Mt. Coronet toget to Spear Pillar. I was told they didn't have an opening for last week's episodes. So, it was Rock Climb. I have to be honest, I love Snover and was kinda hoping it would join somehow, lol, but either way I like this episode since it my favorite one of Ash's Pokemon, Grotle, seems to get some nice screentime. Yes it did and the pictures of Staraptor were posted in the discussion thread for said episode. I don't really have the time or patience to focus on nature's and IV'S, I just play with what I'm handed.. I was kind of wondering if they'd update the OP with the switch to HD, but I guess not. You know, like rearrange some of the scenes. Maybe add Barry to the part with the rivals, and the other TG grunts. Also, the HD looks nice. I mean it's the same animation, but imo it looks a bit more detailed. There's no business like SNOW business! Do you know how many awful pun jokes you can make with the word SNOW? It's SNOW damn easy! This episode stars Snover, the lovable SNOW clover that makes an awful pun in the name itself. Let's get this SNOW on the road! To get the part that everybody cares about out of the way - TITLE SCREEN! All badges and ribbons won fly by, which will no doubt be updated like the title screen in Hoenn. These writers are taunting me by giving Cherubi another episode while settling with 3 seconds of Cherrim in this. SNOW fair! But yes, Snover is an adorable piece of SNOW-calorie cuteness! You know what they say, there's SNOW place like home! That said, I never before noticed that Snover had a cone bra on its back. What a SNOW-off. 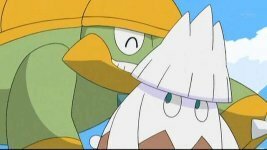 This episode reminded me a lot of that Hippopotterybarn episode in early Sinnoh in that it featured an obnoxiously cute Pokemon trying to find friends, featured TR prominently throughout the episode (i.e. poor use of them), but had the old Natsume charm to spice things up visually. And that one got SNOW stars out of four. SNOW way, SNOW how. SNOW what, you ask? This SNOW-and-steady venture all makes for a formulaic outing that proves that once you go HD, you can always go back...to formulaic stories. SNOW buts about it. EDIT: Forgot to mention that I did like the touch with using Oracion for Grasswhistle. To end this, I suppose it would be appropriate to say, "That's our SNOW, folks!" I promise the DP122 review will contain less puns but somehow also be even less witty. It was a great episode, i found absolutely nothing wrong with it. grotle got a lot of screen time and the part where it learned rock climb was just awesome. The only thing i hate is that a pokemon that would have fit the cast perfectly got left with a bunch of school kids. that move that snover use that looks like frenzy plant, does anyone know what it is? A strong offence makes for a great defence. Grotle gained a new fan in this episode- I was never all that keen on it as a Turtwig or in its current form, at least compared to the rest of Ash's awesome team, but this episode was a saving grace for it. Also, I am in love with that Snover- too bad Ash has a full team already and Dawn has two ice-users as it is, cause I think it would be good in contests. If only Brock ad caught it, cause I really really want to see more of Snover. Snover's so chibi, but otherwise, they should have caught Snover and replaced Buizel with it, because Snover and Grotle had a brilliant team dynamic to it, they worked well with each other. Platinum FC: 0560 5680 6034. Jesus, he knows me, and he knows I'm right, I've been talking to Jesus all my life, and he's been telling me everything's going to be alright. I AM THE EGGMAN, I AM TYHE EGGMAN, I AM THE WALRUS GOOB GAJOOB. Ash as usual leaves every strong pokemon with small kids?! I like when pokemom learn attack like that, very emotional and unique moment. This was a great episode. Grotle finally got an episode centered around it. It was a little upsetting however that grotle learned a move that made it capable of moving faster. It kind of destroyed everything shinjis torterra tried to teach it, but i guess i would have to wait to see its reaction in the future. Can't wait to see how grotle incorporates rock climb into the gym battle with candice. Grotle's Rock climb was needless to say, Beyond awsome! the way it zoomed ahead to save it's poor friend Snover is brilliant. also, did anyone notice the small bit of Kricktot in this episode? Also, Evil-train-dude is easily 4th or 5th on the list of greatest things ever. Agreed, but only on the count of it being a Zelda Boss. Snover does not have any opening for a mouth, WEIRD! Does anyone have any idea about what attack Snover used that looked extremely like Frenzy plant?